I should probably start this review by reminding infrequent readers that 2012 is my first semi-sabbatical year as far as reviewing stuff on the internet is concerned. I’m a newly-minded dad, my time is limited, and one good way to give myself more time is to cut down on reading. But my birthday is this month, and, heck, I deserve the occasional treat. That’s how I ended up cracking open Kevin David Anderson & Sam Stall’s Night of the Living Trekkies, my first novel in months that’s not motivated by having just seen the movie adaptation. My expectations weren’t particularly high. The entire plot is almost entirely explained in the title: Mash a Star Trek convention with a zombie invasion and, well, there you have it. We know how this thing’s going to go from years of zombie movies. As a reader looking for a bit of escapism, I was expecting the usual zombie-invasion narrative arc, some Trek references and (hopefully) a happy ending deviating from the usual “everybody dies” cliché. Where the book starts to deliver on more than the stock premise is in its characterization. Our hero is an Afghanistan veteran whose has come home with the intention of hiding out in a job with no responsibilities and zero potential for danger. In the midst of a zombie uprising, though, our protagonist finds himself forced into a position of leadership with a lot of potential for personal growth. He is soon surrounded by an assortment of well-sketched characters, some of them with conflicting agendas. 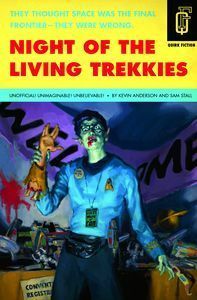 While the novel has a few technically regrettable point-of-view problems (including a temporary jump into a minor character’s thought processes), Night of the Living Trekkies is written with a certain amount of narrative cleverness, and the novel is rarely less than interesting. Well-conceived sequences reach an apex of sorts with a dramatic action sequence in a parking garage. The chuckles are carefully balanced with the chills, creating a successful comedy/horror hybrid. It even comes to develop a richer back-story than the usual “zombies braaaiiins” shtick, leading to a solidly science-fictional rationale for the zombies that dovetails nicely with the Star Trek motif of the novel. In a few words, Night of the Living Trekkies succeeds at what it intends to be. The cover makes it clear that this is supposed to be lurid pulp-fiction, but it delivers on this premise without going over-the-top with the gore, or forgetting that a solid plot is essential in carrying the side-gags. It even had me writing my first review in nearly two months and isn’t that something for someone who should be spending time cleaning up his basement?